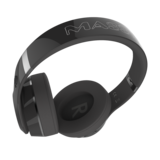 The MASSIVE Wired Headphones are built for comfort, function, style and sound quality. 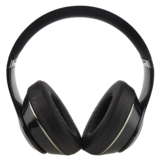 Their leather ear pads and adjustable headband ensures a universal comfortable fit. The built-in noise canceling microphone captures your voice perfectly for gaming or talking on the phone. 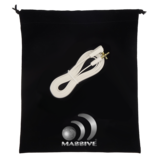 In-Line buttons on tangle free flat wire allow you to have full control over music, phone and volume. You can even share your music with friends via the auxiliary IN & OUT jacks. 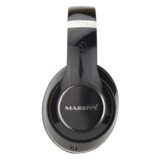 Designed with a glossy black piano finish and stylish MASSIVE logos let audiophiles and bass heads sport these headphones in style. The oversized speakers produce superb sound quality and fantastic low frequency that TRULY make you feel like your in the club. 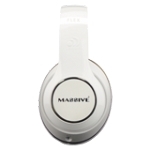 Keep your phone or iPod in your pocket and relax while these headphones do all the heavy lifting and hitting. All headphones fold for travel and come with a MASSIVE carrying bag.